I found a nice old Baer PII made at the Hillsdale shop made in 1995. My 1st LB, and more accurate then I can shoot. 1st owner put 3K rounds thru her, and I have about another 500 rounds shot. My shooting buddy whom I call the Human Ransom Rest (for good reason) first time shooting her, put three rounds in the same hole at 25 ft. Handed her back to me and joking said this gun is boring since it is so accurate. I do mean the same hole, not even a cluster. Working up some loads with 200Gr SWC with 231 and Titegroup powders. Seems that the 231 powder has accuracy edge so far.Oh so Happy! I would hate for you to have to shoot that "boring" gun, so just send it to me. Nice looking, enjoy shooting it. Wait 'till to really smooths out at about 10k rounds. Dave W-Good try,no chance of sending it to anyone! It would have to be pried from my cold dead hands (as Mr Heston said) before I would let her go. I am asking my wife to bury it with me when I go, along with my Python and my HK P7M8. But I doubt she will, she likes them all too much too. I did not say it was boring, my shooting buddy said that jokingly, I love an accurate pistol, nothing finer. Jim 1855- From what I have read about Les Baers, this one is barely broken in, and it is smooth now, and it is hard for me to imagine it getting smoother. But I look forward to the day. The trigger is right at 4lbs, which is heavier that what I like, but it breaks very clean. My ideal trigger is 3lbs (non-carry), I might have to do something about that, I am sure it would not take much. Congrats on a great pick up. My PII is about 4 years old and has had 20,000 rounds through it. Very accurate and still just as tight as after 1,000. Still have to tap out the bushing with the barrel. Congratulations on that. Baers are sweet and have a unique, special, feeling to themselves. John from the 1849 version of Sutter's Fort, CA; and traveling. Last year I found a nice one in hard chrome. A Hillsdale pistol which Baer said was made in 97. 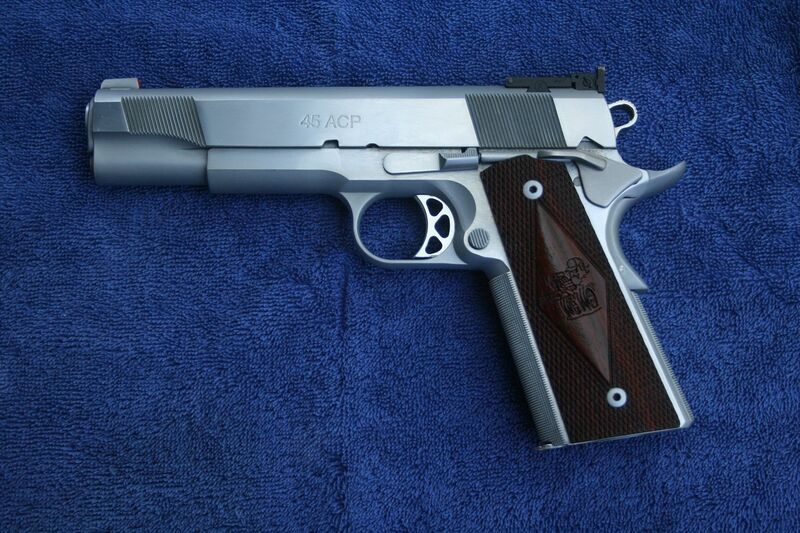 Lovely pistol. Should have mentioned that my 97 has a serial number of LB5xxx in case others are interested. My Premier II is from 1995 also, mid 2300 serial number. It’s definitely been a great gun.